Top 5 Causes of Sleep Apnea + How to Prevent Them | Advanced Sleep Medicine Services, Inc. Many people are becoming more and more familiar with the prevalence of sleep disorders. Many have been sufferers of sleep apnea, but not all have taken the steps necessary to prevent or diagnose their sleep disorder. While it can’t always be prevented, there are some steps that can be taken to lessen the chance of OSA or worsened OSA. Sleep apnea is a common condition impacting thousands of people in the United States. When one has obstructive sleep apnea, their airway becomes blocked during sleep, thereby reducing or eliminating the ability to take in oxygen essential to a healthy body. This can cause quickened starting and stopping of breathing and sleep during the night. This can be a dangerous health issue if left untreated. 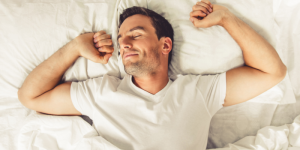 If you have concerns about the potential for developing sleep apnea, it’s important to become educated about the causes as well as prevention tactics. Individuals who are obese are likely sufferers of obstructive sleep apnea. In fact, forty-five percent of those with OSA are obese1. It can be a cause of OSA but also a result of it being left untreated. When you have extra weight, it can cause difficulty breathing at night, because there is greater pressure on the airways. However, if you have OSA from a different cause, you may become obese if you never undergo treatment. When your body isn’t getting the sleep it needs, it retaliates in different ways. For some, this is excessive weight gain. Some studies2 even show that the reason for this is that OSA reduces the effects of leptin, a weight reducing compound in the body. If family members have a sleep disorder, it raises the chances that their children may as well. This could be due to the physical structure of the neck but also for reasons unknown. Additionally, there are other genetic factors at play. These would be conditions like cleft lip or down syndrome. This is due to the way they impact the facial bones and tongue. The airway needs to be clear and non-obstructive in order for the respiratory system to work as it should. There is a relation between endocrine disorders and sleep apnea, specifically hypothyroidism and acromegaly. If these disorders are treated, they may aid in the severity a person’s sleep apnea. They both can impact hormone levels and the shape of the neck. Unfortunately, older adults are usually at higher risk of having a sleep disorder. Males are also at a greater risk of having OSA. As you age, the upper airways stiffen during sleep. This is because the brain is not as able to relax the muscles while sleeping. The best way to ward this off is a healthy diet and exercise in addition to keeping your mind sharp. Smoking increases inflammation in the throat as well as increases swelling in the upper airway. Smoking can worsen the symptoms of OSA. Some studies have suggested that those who have untreated sleep apnea may be more prone to developing the habit of smoking3. This could be because of the stress caused by not getting enough sleep. Alcohol is also an additional risk factor because of how it relaxes the muscles in the throat. There isn’t always a way to prevent obstructive sleep apnea, but there are some things that may help. The core of all prevention for health risks is to simply take care of yourself. This means adopting a healthy diet as well as an exercise regimen. Your doctor will be able to give you specific recommendations for your age and weight, but generally sticking to these lifestyle choices can make a great difference. Quit or eliminate smoking and alcohol use. Exercise regularly with yoga, resistance training or aerobics. Don’t eat a heavy meal or drink before bed. Eat small meals recommended to meet the requirements in the food pyramid. You will need to ask your doctor if you need a study and what type of study is best for you. These are the ones that we offer at our clinic. There is also an at-home option which is best suited for those who have trouble getting to a sleep center. is key! Contact us for any questions you may have or to schedule your sleep test today. Young T, Palta M, Dempsey J, Skatrud J, Weber S, Badr S. The occurrence of sleep-disordered breathing among middle-aged adults. N Engl J Med. 1993;328(17):1230–1235. Phillips BG, Kato M, Narkiewicz K, Choe I, Somers VK. Increases in leptin levels, sympathetic drive, and weight gain in obstructive sleep apnea. Am J Physiol Heart Circ Physiol. 2000;279(1):H234–H237. Krishnan, Dixon-Williams & Thornton (2014) Krishnan V, Dixon-Williams S, Thornton JD. Where there is smoke…there is sleep apnea. Chest. 2014;146(6):1673–1680. doi: 10.1378/chest.14-0772.